will like to introduce myself to you properly. I am Mrs. Christy Walton a great citizen of United States of America. Women in the World. But as the saying goes, money is not everything. Dollars). I intend to use the $ 9,000,000,000.00 for CHARITY. in the past, but this is the biggest project of them all. dispose everything with your Godly mind just as you will receive from me. are filled with tears as I await my death. further and please do keep this confidential. ADDRESSES. . . . . . . . . . MOBILE:. . . . . . . . . . . . Thanks for your response, you see life is what we all will live behind on a very good day, meaning we all on this earth are going to die one after the other but the important thing is that we should live a good remarkable life while still on earth. In this regards I intend to reach out to all sector of Charity both the Young people, Education, Development of under Develop Area. You see as a matter of fact, I was brought up by my Aunt and been a person without any parent my Aunt maltreated me so much because I had no parent to cry to, so along the line to cut the story short after my college I meant a man whom assisted in my Education and everything then, as luck may have it I got married to the man. So that was the reason while I love to help people in need and must especially CHARITY. On Monthly based I give to Charity some amount of Money and cloths but when I traveled out of America to England for a friend's wedding ceremony, I entrusted one of my relatives to help me out in supplying those items and Money I usually give out to CHARITY but surprisingly to me he ran away with all the items and Money so because of that, I lot trust on all of them. But another similar occasion I used an Unknown person a Nurse in one of the Hospital i was admitted, that has the love to help so the person did it according to how I explained to the person so that was why I put my trust on other people but the problem now was that I lost contact with that good man that helped me out before. So I will be very grateful if you work with me accordingly and give me your trust and seriousness in this regards, I await your response to enable us proceed further. 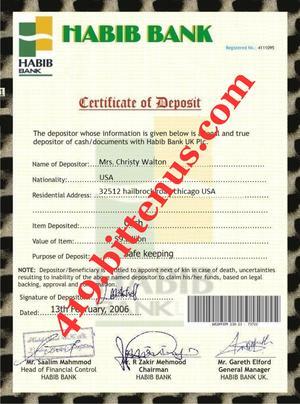 As a matter of fact the $9,000,000,000:00 (Nine Billion United State Dollars) I intend to transfer to you and put in your care to help me donate to CHARITY is in my HABIB Bank United Kingdom Account in with Account number 095449625166 Account Name Mrs. Christy Walton so I will want you to contact the HABIB Bank united Kingdom with the below address to open an online Account with them and forward to me the Account details such as Account number and Account Name to enable me put you true on how to transfer the funds in your online Account with HABIB Bank. Do contact the bank manager directly Mr Gareth Elford, he is the one in charge of the funds transfer. 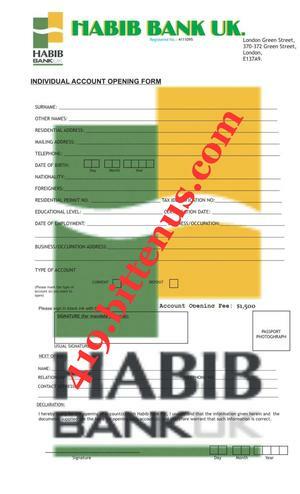 BELOW IS THE BANK CONTACT. Blessings to you in the name of God, i have not hear from you since i ask you to contact the bank and setup an online account, i am really worried and my mind is not at rest, please i beg you let me know how far you have gone with the bank, in setting up your online account, so that my mind will be at rest, i am very sick and i need you to act fast in getting the online account created, to enable you begin with the project, in other for me to see what will be done for the needy in my name, so i beg you my dear, let me know how far you have gone with the bank, so that i will not be worried all day. Greetings to you from HABIB BANK United Kingdom, we are here to provide you our online service 9 hours, 7 working days from Monday-Sunday in a week. Carefully open and read the attach form to enable you fill it out and send it back to us,so that we can have your full details and get your online account created, in other for us to proceed with the Charity project funds transfer directly into your Home Country,to enableyou donate it to the needy as it has been instructed by your Client Mrs Christy Walton, Be inform our online account opening fee is 1,500 dollars. Note: once your online account has been created the Charity project funds will be transfer to you within 2 working days. > Subject: Secured Charity Project. .
> condition in life and in particular what i intend doing for CHARITY. > I am Mrs. Christy Walton a widow and businesswoman, an American Citizen. > which rated me as the 2nd Richest Woman in the World. > few weeks ago my Doctors in America told me I have few months to live. > (Nine Billion United State Dollars).